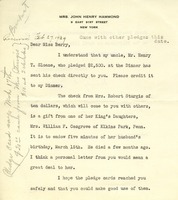 Emily Hammond sends Martha Berry a letter about a $2,500 donation made by her uncle, Henry T. Sloane. Mrs. Hammond also discusses a $10 check written by Mrs. Sturgis and a check from Mrs. Cosgrove that will be sent to Martha Berry. 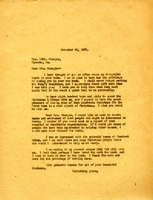 Lastly, Mrs. Hammond tells Martha Berry that 20 people are interested in the Pilgrimage on April 15th and that she will do her best to accompany them. Miss Thomas sends $50 on behalf of the "Faithful Workers" Circle from the King's Daughters of the Holy Trinity Church. 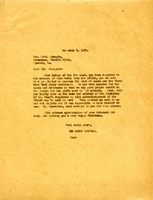 Martha writes to Mrs. Sturgis to try and secure names and addresses of those who would be interested in the work at the Berry schools. 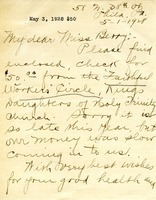 The Berry Schools write to Mrs. Sturgis in Miss Berry's absence, asking her for the names and addresses from the Theodore Hook story. 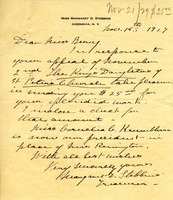 They also ask for the name and address of the secretary of the King's Daughters so they can thank her for the donation. The address included was illegible so they send the receipt for the donation to Mrs. Sturgis. 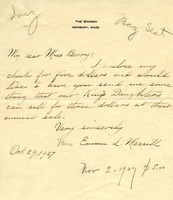 Emma L. Merrill sends Martha Berry $5.00 and asks to be sent something that the King's Daughters can sell. Miss Stebbins sends a $25.00 donation to The Berry Schools on behalf of The King's Daughters of St. Peter's Church.